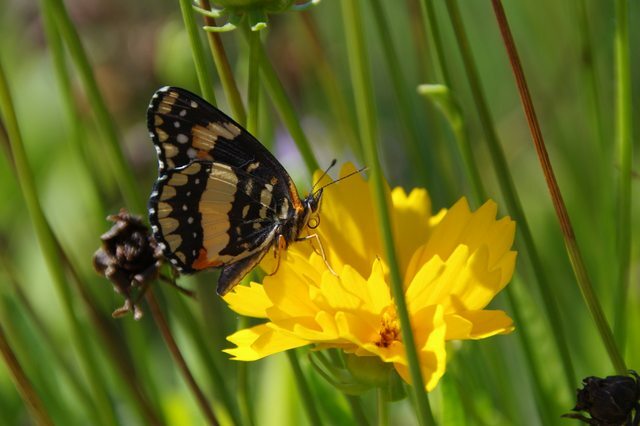 In addition to the gladiolus photograph, I’m entering a picture of a butterfly on a coreopsis blossom in our backyard. I’ve never seen a butterfly that looks like this prior to this year, but they’ve been regular visitors to our garden all summer long. I saved this butterfly from the clutches of a praying mantis shortly after I took this photograph. 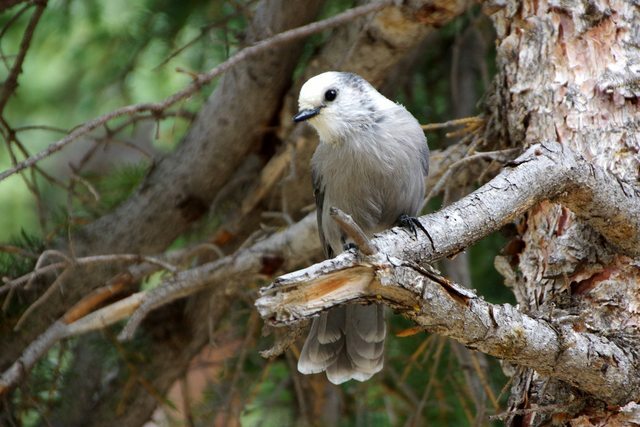 The bird photograph that I selected to enter is a photo of a gray jay from our recent backpacking trip in New Mexico — I WISH I had gray jays in my backyard! Their faces are adorable, and I love how curious they are. I don’t normally ask for other people’s opinions (except for my husband…who picked out the Amsterdam/Bicycle photo that won me first place in the amateur adult color photography competition in last year’s Tri-State Fair) when I’m choosing which photos to enter into competitions. I decided to do something a little different this year. Bryan and I narrowed down my potential entries to 6 photos. 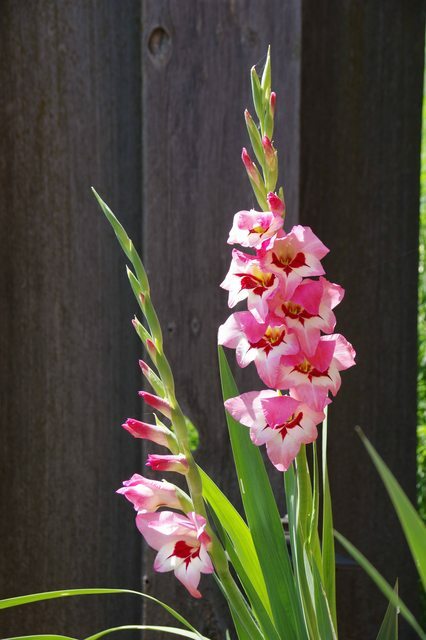 I posted them on my Facebook account and asked people to “like” or comment on their favorite photos. The top 4 photos matched up exactly with Bryan’s top 4 choices. I’m going to enter the following 4 photographs into the Tri-State Fair. May of my Facebook friends misidentified the creature in this photo as a frog. 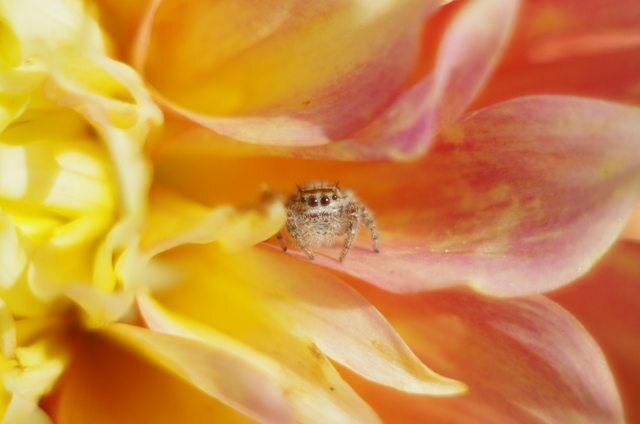 I have bad news for you folks — it’s definitely a spider, but it’s pretty adorable as far as spiders go. This is one of the dahlias that I grow in the flowerbed in our front yard. I always try to enter a photograph that will appeal to people who live in the Texas Panhandle. This year I’ve chosen to enter a photograph that I took while Bryan and I were wandering around the area following a snowstorm. 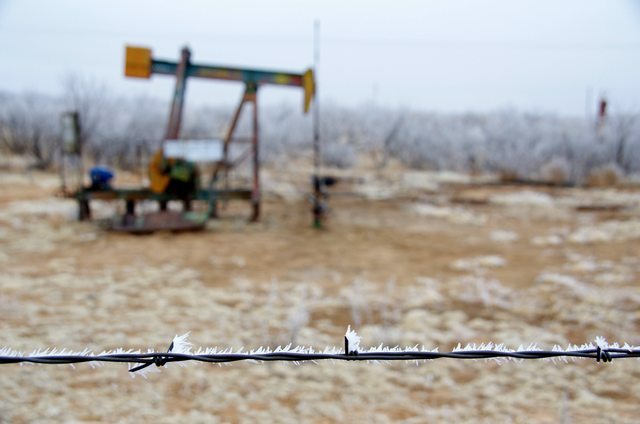 This storm produced advection frost, and I was excited to come across an area on the Spring Creek School Road that allowed me to photograph both advection frost and a pump jack at the same time. For whatever reason, I typically like to enter one photo from a hiking/backpacking/camping adventure. Landscape photographs don’t typically fare very well in the Tri-State Fair photo contest, but I still like to enter them. 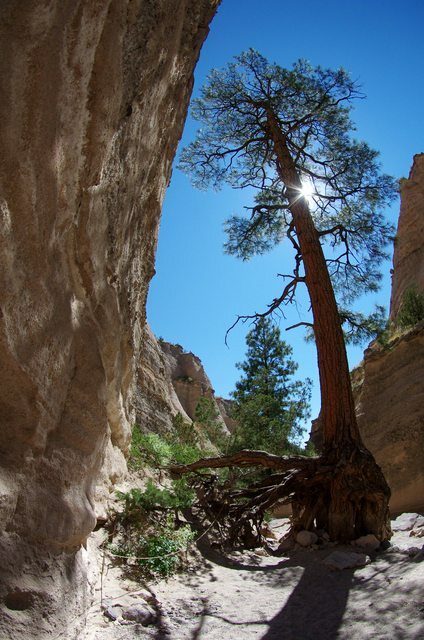 This one offers a little more than a typical landscape photo — it’s portrait-oriented, has interesting lighting, and focuses on an interesting tree. I don’t know if it stands a chance or not, but I’m happy to get to share it with other people. 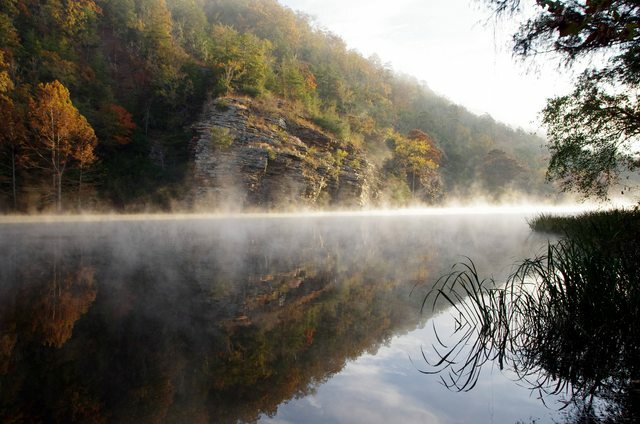 The following photograph of fog floating over the surface of the Mountain Fork River was definitely the most-liked by my friends on Facebook (and is also Bryan’s favorite). Bryan and I arrived at Beaver’s Bend State Park well after dark and had a very difficult time finding a campsite. After driving around the many camping areas multiple times, we finally gave up on finding a “good” campsite and settled on the only one that we came across that seemed unoccupied. We figured it was available for a reason and just knew that it was going to be an awful campsite. In the morning we woke up and discovered this beautiful scene within 50 feet or so of our tent. We spent a decent amount of our time that weekend sitting along the river and staring at the beautiful scenery provided by the cliffs, trees, river, fog, and wildlife (and wishing we owned kayaks). It’s easily one of the most beautiful places we’ve ever pitched our tent. The print that I ordered of this photography didn’t come out quite as colorful as I would have hoped. Mpix does an auto-color-correction on photos prior to printing them, and, in this instance, I wish I would have turned that option off. I’m currently contemplating ordering another print to see what it looks like without the color correction. The Specialty Polymer’s GBU 2016 calendar photo contest was an unexpected surprise! The theme is “Blue Skies,” and I can submit a maximum of three photos. 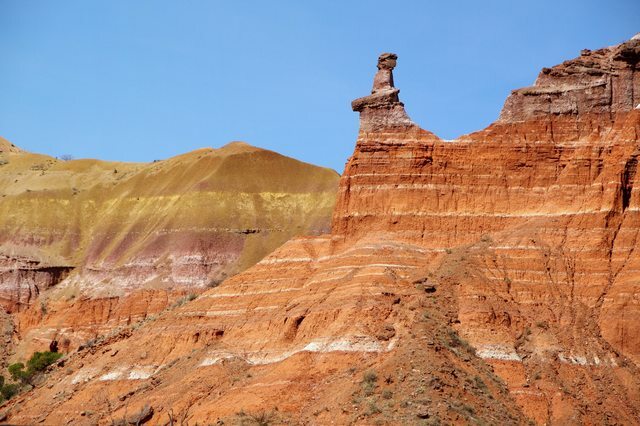 I immediately knew that I wanted to submit at least one photo of Palo Duro Canyon. 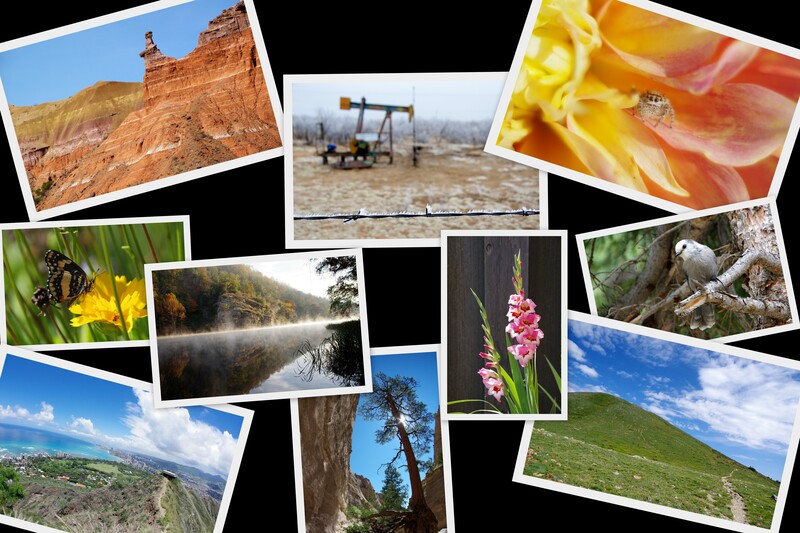 My site is new the company, and I’d love to see the Texas Panhandle represented in the calendar. 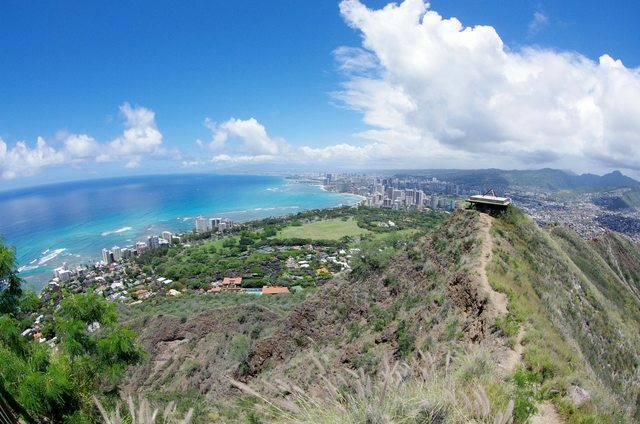 Whenever I think of photos I’ve taken of blue skies, a photo that I took on top of Diamond Head Crater in O’ahu (looking towards Honolulu and Waikiki Beach) always comes to mind. As we started the hike both of us were thinking that it wasn’t going to be worth it and that there were too many people, but this view was definitely worth the hike and worth being surrounded by so many strangers. The other thing that comes to mind when I think of blue skies is mine and Bryan’s many hikes in Carson National Forest. Those outings are dear to me, so I’m excited to submit a photo from one of our hikes. 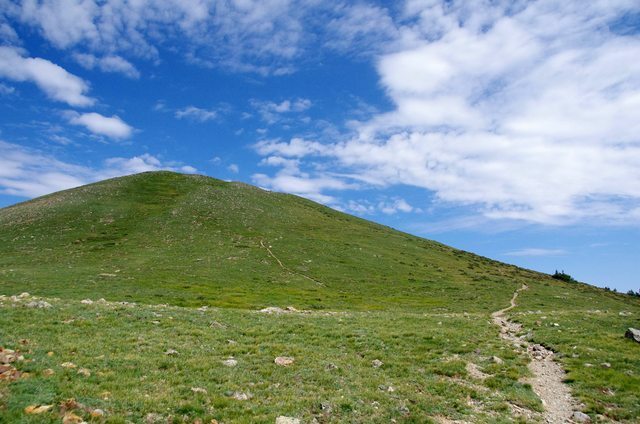 This photo was taken during our 17-mile day-hike up Wheeler Peak (the highest peak in New Mexico) via the Bull of the Woods trail that starts in Taos Ski Valley. That’s definitely the hardest hike that we’ve done, but the views were incredibly, and we saw a ton of wildlife. This photo of La Cal Basin is one of my favorites from that day. And just when I thought I was finished, I came across a Facebook post announcing Palo Duro Canyon State Park’s 2015 photo contest. Entries aren’t due until December, so I’ll wait a little while before I start picking out photos for that contest.